I want to take a quick moment to talk about one particular achilles heal and possible cause of driveability issues in the modern diesel engine, Exhaust gas re-circulation (EGR), specifically in diesel vehicles (although it does effect petrol engines, although to a lesser extent). With the advent of clean diesels, one of the larger changes has been the massive increase of EGR levels running through the engine. EGR takes some exhaust gas, runs it back through your intake manifold via a metering valve (the EGR valve) at different quantities varying on throttle position and load on the engine. Why would we want this dirty exhaust gas going back through the engine, that seems silly. The exhaust gas is mixed with fresh intake air to lower the temperature in the combustion chamber. Even though the exhaust gas is hotter than fresh air, it contains hardly any oxygen, as that has already been burnt and cannot be burned again. So less oxygen means less explosion, which means less heat and pressure. But why? Over certain heat and pressure levels in the combustion chamber comes the massive increase of Nitrogen Oxides (NOx) gases. These nasty gasses are high on the EPA (Environmental Protection Agency) hitlist. They are a massive problem with internal combustion engines and will in the future contribute to the breathing problems of many humans. They are responsible for many environmental misfortunes such as smog and acid rain. Unfortunately, these hot exhaust gases mix with ‘blow-by’ oil, created from pressurised gas passing past the piston and also being routed back through the intake to avoid pressurising the engine’s crankcase. 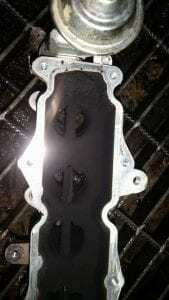 This creates a hard tar like carbon substance to build on the walls of your intake manifold, valves and associated components, eventually starving your engine for air, causing poor fuel economy and all matter of driveablilty issues – usually first indicated by black smoke on acceleration or surging. A quick google image search of diesel intake carbon will quickly open your eyes to the horrors of intake carbon, much like seen below. 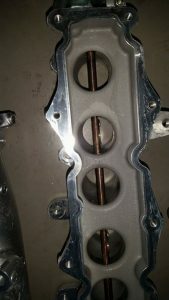 The best bang for you buck, and safest method of cleaning involves manually removing the intake manifold and physically cleaning it in our ultrasonic tank. This is the only way to gaurantee a perfect ‘as new’ clean, as many on-car cleaning methods struggle to break down large deposits, and can create imbalance between cylinders. The result with on-car cleaning can be that all the intake ports do not get cleaned to the same extent, so one cylinder can now be overfuelled while another is underfuelled. Off-car ultrasonic cleaning guarantees balanced cylinder airflow, which is important as each cylinder is fuelled via the single mass air flow sensor near the air filter, balanced cylinder air flow is very important. Call us today to talk about how we can maintain and restore your diesel fuel efficiency and driveability. What Does an Auto Electric Repair Service Do? Why is a Logbook Car Service Important?